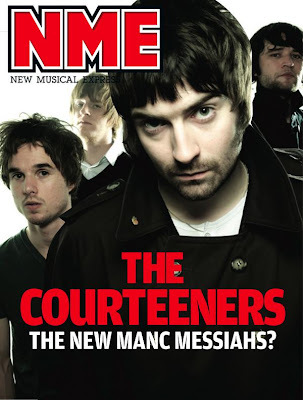 Are THE COURTEENERS destined to be the next Next Big Thing outta the UK? Rumor has it that MORRISSEY thinks so. (Of course, I was just writing last week about how he thought JAMES were going to be the Next Big Thing back in the '80s, so one must certainly take his opinion with a grain or two or three of saltpeter). 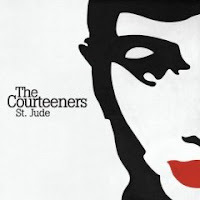 Honestly, though, the Courteeners' "What Took You So Long" reminds me of a James' song (something about the guitars & drums, near as I can tell), though the rest of their debut LP, ST. JUDE, leans more toward typical, 21st-century Britpop. [MP3] "What Took You So Long"
No, not yet convinced about the hype! But you do know, that The Courteeners play a little sample of James' Tomorrow in What took you so long live? I saw them last Saturday in Cologne and as a James fan I was really pleased to hear Tomorrow. PS: Found your blog twice today. I was searching for The Indelicates' version of A new England. I really love The Indelicates!